Stunning! - I love that you don't skimp on the trees, esp conifers! For the first time in my design career, I have my first "fresh build" small courtyard garden on my hands - starting with rubble! Trees baffle me - even dwarf varieties reach significant mature height... May I ask what your thinking is around this? Will some trees be removed one day and replaced? Pruning? Thank you; inspirational work! Thanks. Good luck on your project! I don't plan on removing any trees. Some are chosen with eventual pruning in mind while some are chosen with ultimate height/width in mind. For a smaller courtyard, I'd say that first I decide where I want people to look. If I want to keep the eye low to avoid a possible eyesore over the top of a wall for example, I'd use lower foliage with lots of texture and perhaps some color. If I want people to look up, I'd use taller columnar trees that keep a tight form. Something like 'Tokyo Tower' fringe tree might be a compromise between the two. If you don't need extra shade, you might look at a standard (tree form) shrub like 'Diabolo' ninebark or a hydrangea paniculata, or a small weeping tree like 'Whitewater' or 'Ruby Falls' redbud. A smaller Japanese maple like 'Hana Matoi' might be useful too, and could be pruned if necessary, or to relate with regard to form to some other garden element. I love designing courtyards more than anything else because everything counts. Plants need to bring multiple features to the plate. I'd never use peonies or irises for example. 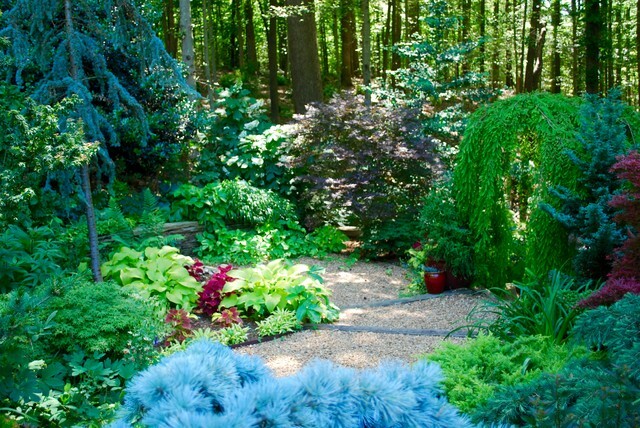 I'd use plants with lots of texture and seasonal foliage or floral highlights, and good winter form. Sublime details with regard to hardscape are important as well because everything is seen up close. Hope this helps. Again, good luck. Woodland garden 1 Front garden on a May afternoon.